Moonstone guitars, founded by Steve Helgeson, has been producing some of the worlds finest hand-crafted acoustic, electric, and bass guitars for nearly 38 years. Self taught, in 1972, Steve set up his first shop in the woods of Moonstone Heights, California. There he experimented primarily with acoustic guitar designs. In 1974, Steve moved to Arcata, California and developed the Earthaxe electric, while also doing repairs for a local music store. In 1976, Steve moved down the street to a larger shop where he built two large acoustic basses, and continued to produce the Earthaxe line, along with a few acoustic 6 strings. From the beginning, Steve has implemented the use of highly figured and exotic imported tone woods. He also pioneered the use of Pacific Quilted Maple, Myrtlewood, Maple, and Walnut Burl. In 1977, Steve settled into an even larger shop, an old church, further down the street. He collected some light production machinery, hired employees, and expanded his line of instruments. By the early 1980’s, Moonstone reached its peak of production, shipping over 1000 guitars throughout the United States and Europe. Late in the 1980s, the Moonstone factory was destroyed by arson. By 1990, Steve salvaged most of the equipment and inventory and built a new shop in Eureka, California. Working alone, Steve delved into the art of designing and voicing new acoustic guitars. The J-90 auditorium size acoustic was conceived and the first models had side, backs, and necks of West African Wenge, with Englemann or Sitka Spruce sound boards. Wenge produces a very high and low frequency, resulting in a very loud, balanced tone. This model is now built using wide flamed and quilted Maple, heavily figured Koa, Macassar Ebony and Rosewoods, including the Negra species , known as Brazilian Rosewood. Steve personally carves and dimensions the scalloped X-braces on all guitar tops, removing weight, desiring a tall and thin profile. He tap tunes each top until it loosens and vibrates freely as a sound plate (voicing procedure). After nineteen or more years of doing so, Steve has fine-tuned this operation. In 1995, the B-95 acoustic bass was designed and built in 4 or 5 string cutaway versions. The large body design (20 inch wide lower bout) allows the volume of this bass to be heard when accompanied by two oe more acoustic guitars without being drowned out. It is also optionally amplified. Steve has constructed commissioned instruments in the traditional slot-head fashion of the 1920s and 1930s: in 00. 000. and 0M sizes: with 42 and 45 style abalone trim. 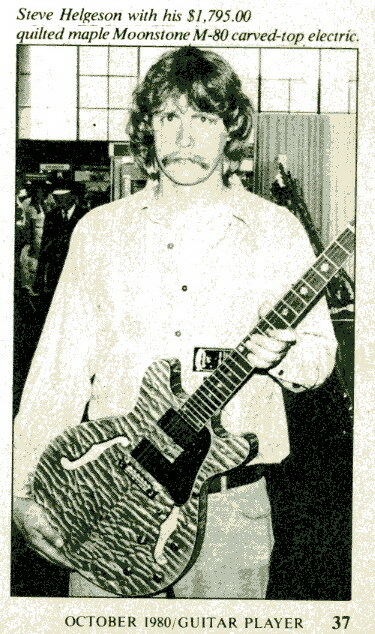 In 1996, Steve reissued the M-80 semi-hollow body electric. It has carved top and back plates, and is offered with a solid sustain block, or with carved in tone bar bracing. It has changed to a 22-fret set neck, although a 24-fret model is still available. In 1997 the Vulcan Standard was re-issued. It is lightweight (7 1/4lbs.) with a one-piece Mahagony set neck and body. It has an exquisitely carved, quilted, or curly Maple bound top. Both of these electrics are the jewels of the line. These are very versatile instruments, jazz players and rock musicians alike. Most recently, the J-99 super slope shoulder jumbo acoustic was designed and built as a 12-fret finger style guitar. It has incredible bass response, with balanced mid range and treble. All acoustics are also offered in cut-away version. Both professional and amateur musicians give high praise to the superiority and distinctive quality of Moonstone guitars, and numerous magazines and periodicals dedicated to the subject of fine stringed instruments have applauded Moonstones excellence and integrity. Moonstone is pleased to custom-build any guitar from its line, or from imagination, to meet individual specifications. Most all Moonstone guitars are supplied with a deluxe hard-shell Harptone or TKL case.